According to a recent Bloomberg News report, the youngest adult generation, the Millennials, hold the largest percentage of any generation with student debt. For a $33,000 debt, assuming the loan will be repaid in the standard 10 year period, individuals will repay a total of $45,571, which includes $12,571 in interest. The increasing debt-load affects our youngest adult generation’s decisions, like getting married or buying a house, which is also collectively impacting our society. The macroeconomic ramifications are well-documented. Baby boomers house a record level of their millennial offspring who can’t afford to leave home. Birth rates have fallen to a 30-year low as marriage is put off. Emanating from this trend is the money not plunked into nesting as families grow, a consequence not lost on Federal Reserve Chairman Jerome Powell. “You do stand to see longer-term negative effects on people who can’t pay off their student loans. It hurts their credit rating, it impacts the entire half of their economic life,” Powell said in March. I was out of my parents’ house and supporting myself by 19 [years old]. My children are 27 and 29 [years old] but they’re living in their childhood home, without being able to pay even the monthly mortgage, and I’m losing the rental income while I help them. Things certainly have changed. Additionally, an estimated 44 million Americans now have student loan debt, or approximately one in four American adults, according to a recent Forbes article. 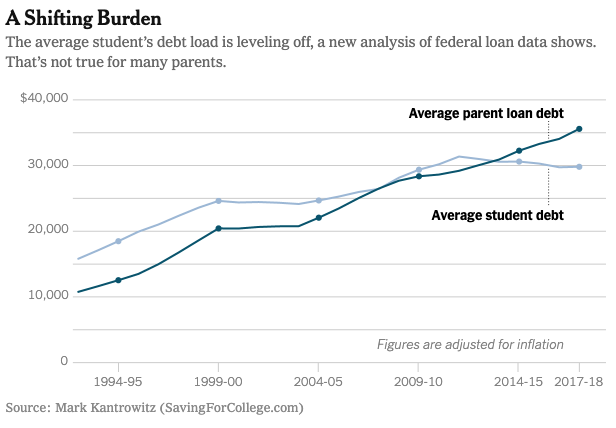 The average amount parents are borrowing to pay their children’s college costs increased 19.2% in just four years from 2012-16. So, not only are our youngest adults being handicapped with debt repayment, the aging adult population is also increasing their financial burdens. An increasing number of parents assume unintended risks when taking on college-related debt, since they often sacrifice saving for retirement or retiring at all to repay loans. Thus, parents may work more years, which then reduces employment opportunities for new college graduates. Then, the original purpose of a young person attending college in the first place is unfulfilled. Adding insult to injury, a family is also now burdened by the financial hardships of repaying debt. So, the question ”What’s the value of college?” has even greater urgency to be examined, especially for the families with high school seniors selecting colleges before May 1. Previous Is College the New Speculation?